In text-mode PC operating systems that use the default font, it's easy to tell the difference between different control characters. Control-A is a dark happy face, Control-B is a light happy face, etc. In Windows, however, it's not so easy. 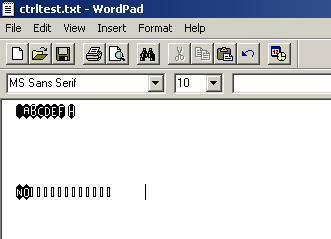 MS Sans Serif (the default screen bitmap font) does not even include glyphs for control characters. Instead, an ugly indistinquishable box is used. My sserife.fon file fixes this problem. 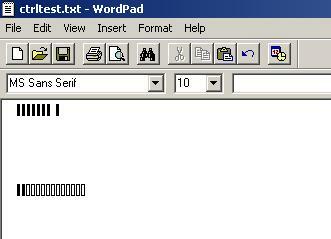 Open ctrltest.txt in Wordpad, and set the font face to MS Sans Serif, size 10. Control characters should display in place of black boxes.